It's been quite a while since we posted an Alphabet Adventure, and it's actually been quite a while since we went on this adventure. 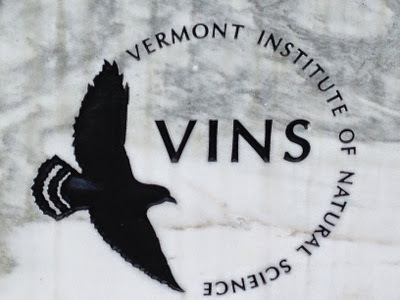 For our V adventure we headed to the Vermont Institute of Natural Science (VINS) in Woodstock, VT. VINS is a great place to see rescued raptors of many kinds, in a beautiful location. We knew we could see Turkey Vultures on our visit, which would fit our V theme, but we were also eager to see some of the other birds too. 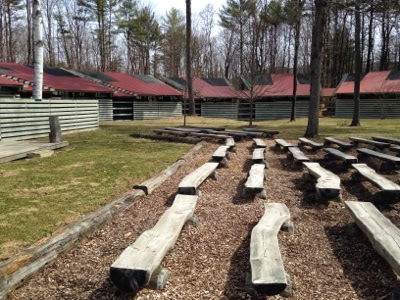 Much of the public areas of VINS are outside, although the center does include several buildings as well as nature trails, an outdoor presentation area, and picnic areas. We visited on a chilly spring day and would love to go back when it's a little warmer. We started our visit with an informational presentation with live birds. The presenters shared a red-tailed hawk, a barred owl, a turkey vulture, and a falcon. Although photographs were allowed, we were a little distracted watching and keeping Little Brother busy so we missed our chance. Afterwards we roamed the grounds and saw several different birds. One of our favorites was the bald eagles. All of the birds were rescued due to illness and injury, and unable to return to the wild, so therefore they live at the center instead. We also enjoyed all the informational signs and interactive displays. Big Brother especially enjoyed seeing which bird his arm span matched. We also enjoyed some of the hands on activities in the different science buildings. In one building we explored reptiles and amphibians and read animal descriptions and guessed which animal it was, and we also had a chance to explore some preserved animal parts. In another building we played with animal puppets and read some great picture books. At the end of our visit we walked around on a shorter nature trail. We stopped for a moment at this cool display: a man made nest the size of a bald eagle's nest. It could easily fit the boys and I! It was fun to check out a place that we (the grown-ups) had not been to in quite a while and introduce the center to the boys. We did wish it was warmer so we could stay and enjoy it a little longer. We waited a few weeks and spring brought along a yard full of violets. We picked a handful and pressed them, as soon as they dry we'll add them to our alphabet book. Other V adventure ideas: vacation, valley, Vermont, and volleyball game. On a side note: We realized we should have visited VINS earlier in the year, Big Brother is now considered a child for their rates. It was a good reminder it's always good to check out when children are free and when they are a different price when planning trips.